I wake up decently early and scramble for my phone. Yes! I beat Queenie to the French jazz station this morning. “Ahh man! You stole my joke!”, I start doing a little dance in bed and Queenie is cracking up. But not because I’m dancing, because I still have pigtails from last night. And the schoolgirl morning giggles are upon us. We look into times for trains running North. 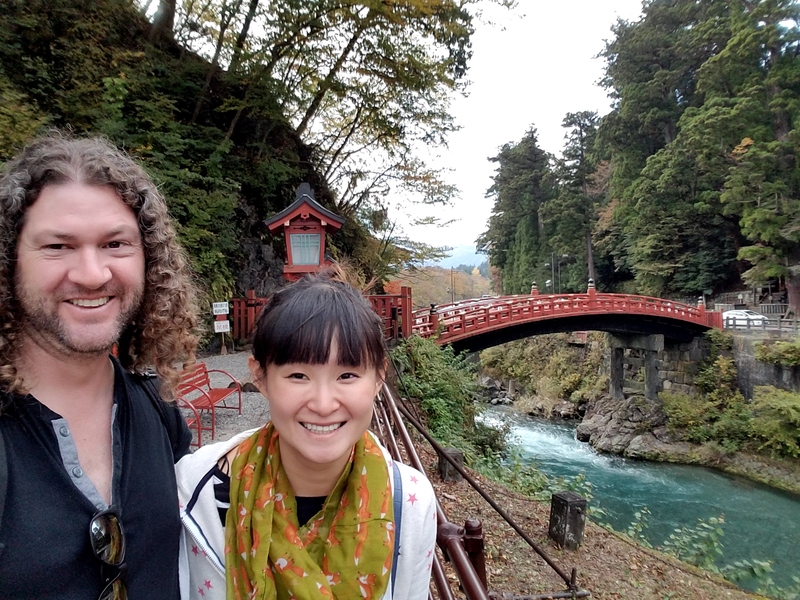 It’s our last day in Tokyo and we thought we’d head to the little mountain town of Nikkō that’s supposed to be really gorgeous with a river running through it and a bunch of temples and Shogun mausoleums preserved in the woods. It’s about 2 hours away. 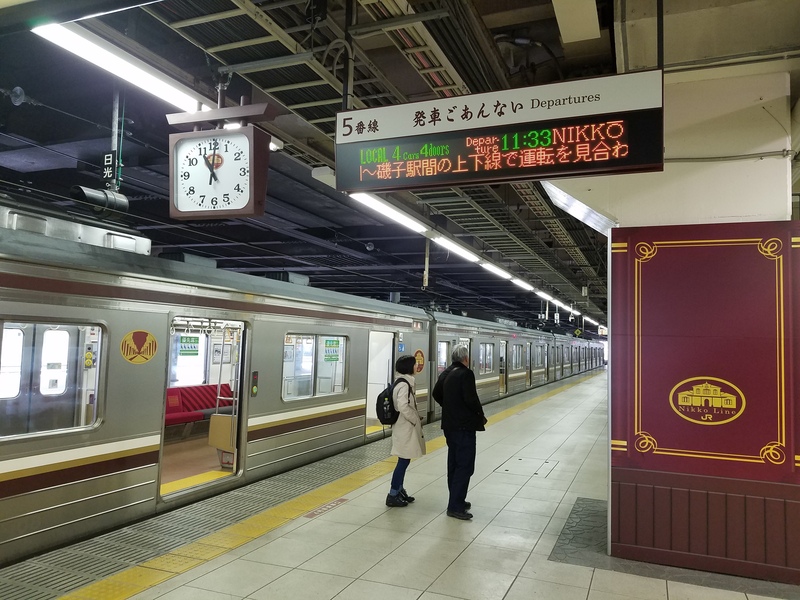 A couple of subways to the shinkansen to another train… probably be there by noonish? (With time spent getting lost and taking the wrong trains taken into consideration). We ask about a quick breakfast place at the hostel front desk and they direct us down the street. We find it no problem. 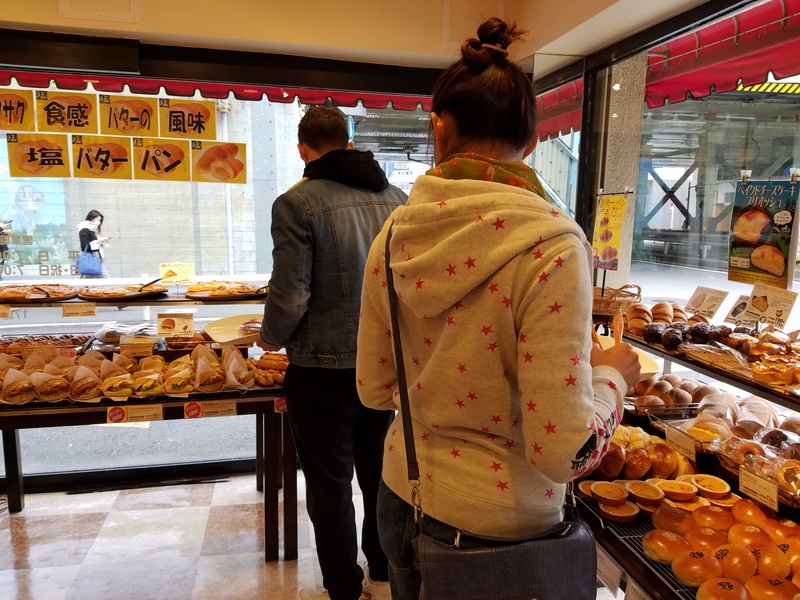 It’s a bakery place where you pick you’re own breakfast items with tongs. It’s good, it’s fast, and it’s easy. There is classical piano playing and people seem to just be chilling and/or reading. Commuters going by outside, to and from the metro station. 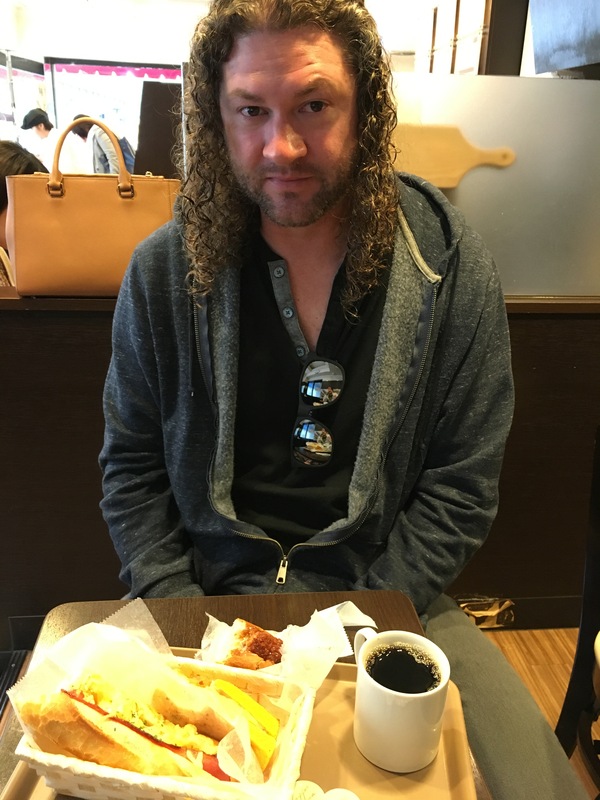 We pick out a few things and get some coffees. Ahhhh this is nice. 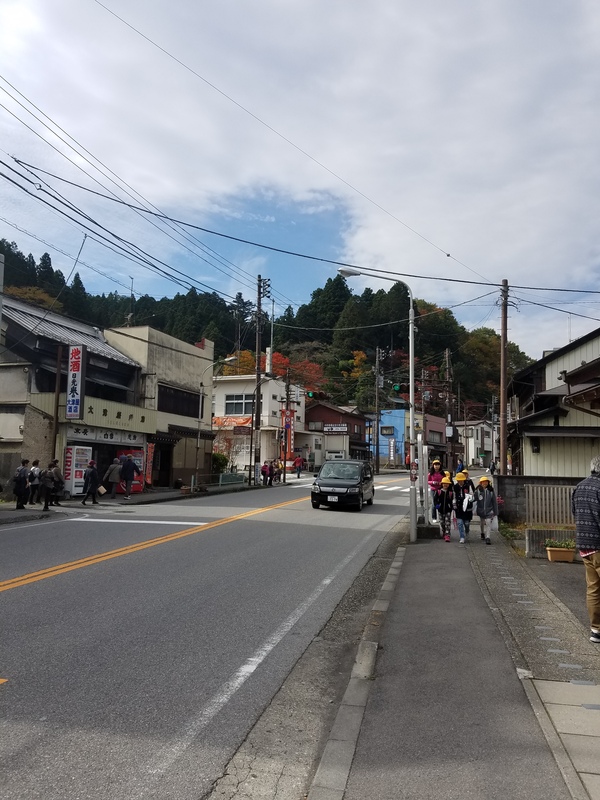 We finish up and go back to the hostel to grab some stuff for the day. 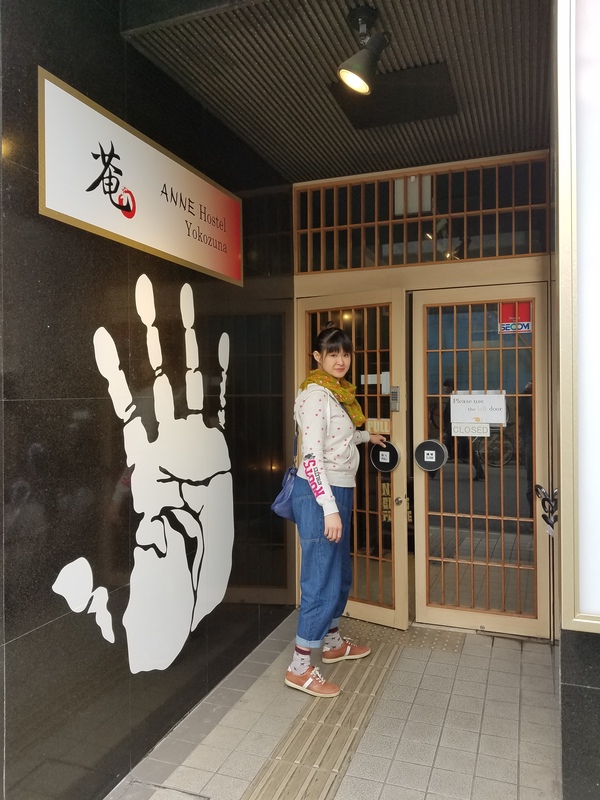 I have to chuckle as we pass by the izakaya next to the hostel, Nishiki. It’s the only place aside from the metro that got to witness our schoolgirl antics the night before. 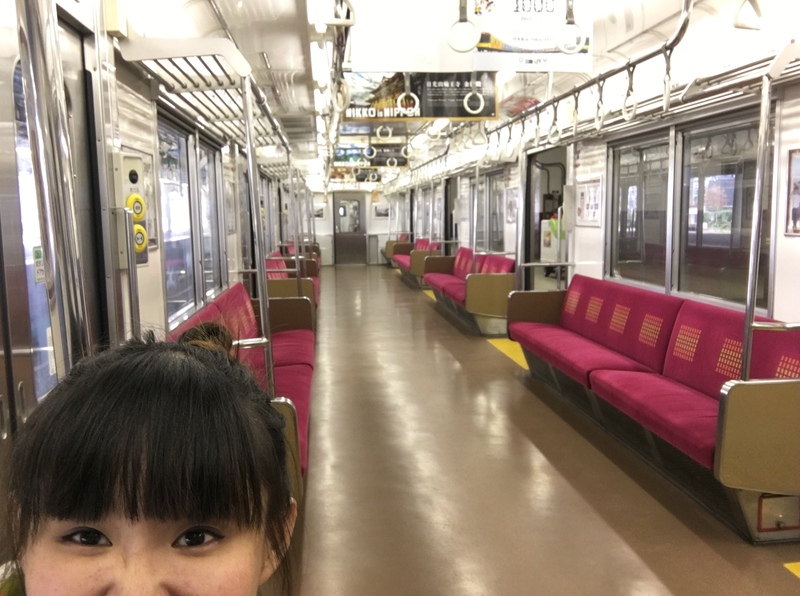 It takes us two subways to get to the shinkansen. 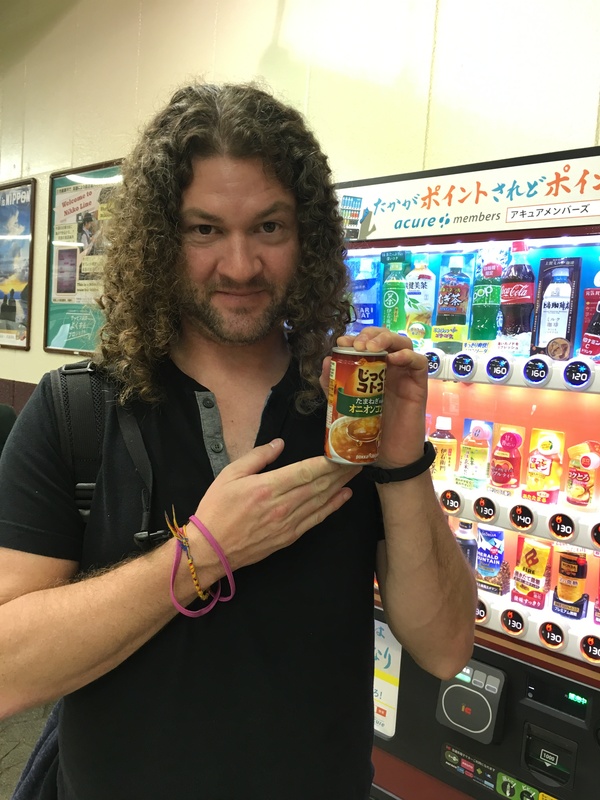 We get our tickets up to the Nikkō area and grab a coffee at Becks to pass the time. I try to get yen at the Atm but it doesn’t work, hopefully we can figure something out up there somewhere. I also take a peak in the train station baby lounge. It’s exactly what I expected, a bunch of babies playing poker, smoking cigars and drinking scotch. The view out the windows of the shinkansen is great as we rocket out of Northern Tokyo and into the mountains. I’m basically asleep for most of the ride though, trying to recover from last nights cross-dressing. I wake up scared shitless by some crazy screeching noise. The train brakes sound like two T-Rexes mating heavily one last time before the asteroid hits. We get off the bullet train and follow signs to the platform for Nikkō . 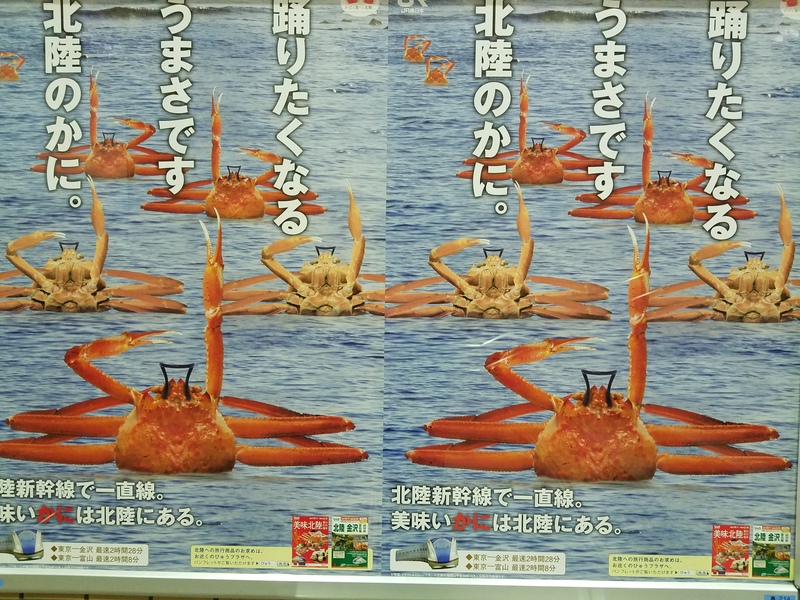 Well no, those are crabs doing synchronized swimming. But we do find the platform and have a bit of time to kill before the train shows up. 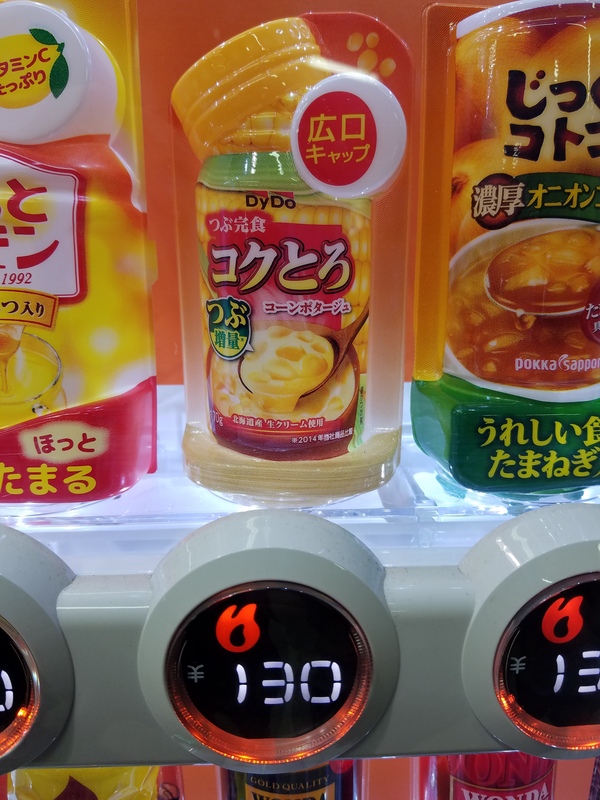 I take a quick look around and notice a vending machine with a hot and a cold section. Queenie points to the middle row, “Oh Bee, these are soups!”, “Whaaaaaaa? 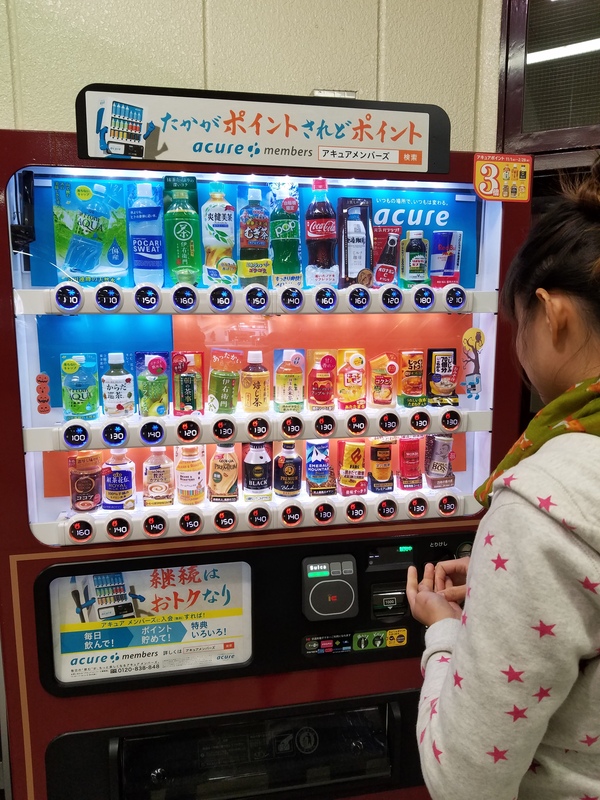 !” Yep, the vending machine has hot soups in it. That’s badass, I’ll have to try it. Cream of corn or Onion? I go with the onion one. Yowsa, it’s pretty hot. We wait for it to cool down a bit and then crack it and drink it like a beer. Actually, that’s really good. Ha, wow. 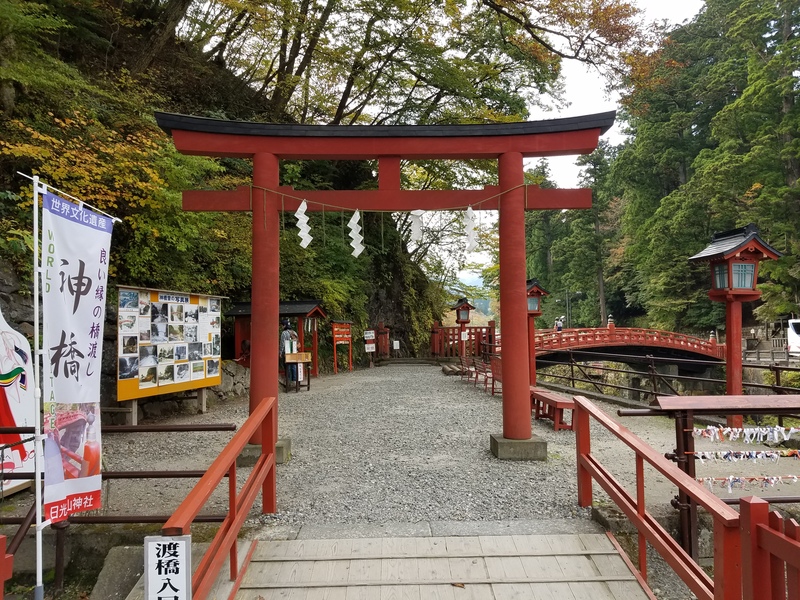 Its a 30 minute walk to the bridge and temples from the train station so we just hoof it. 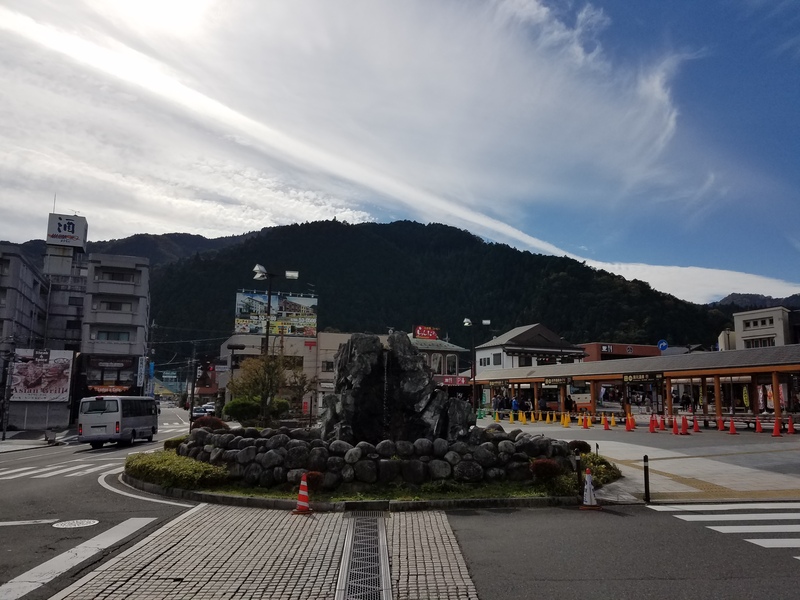 Nikkō is a cute little mountain town. There are a number of quaint shops and restaurants around a central circle. After spending all morning on trains I kind of want to get to the sights though. It is nice to just be out of the city for a change of pace. The air is crisp and clean, the temp is a bit lower. 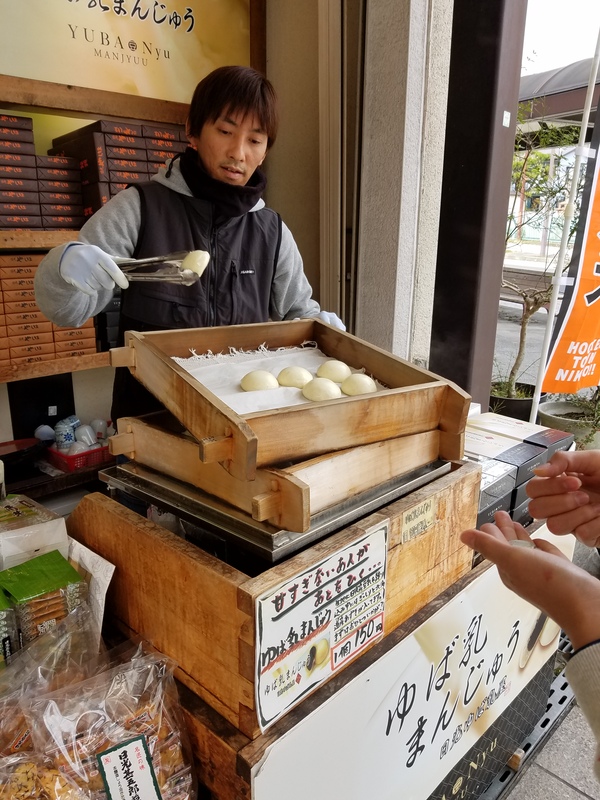 Liking Nikkō so far. We get a steamed bun from a storefront window. Num! 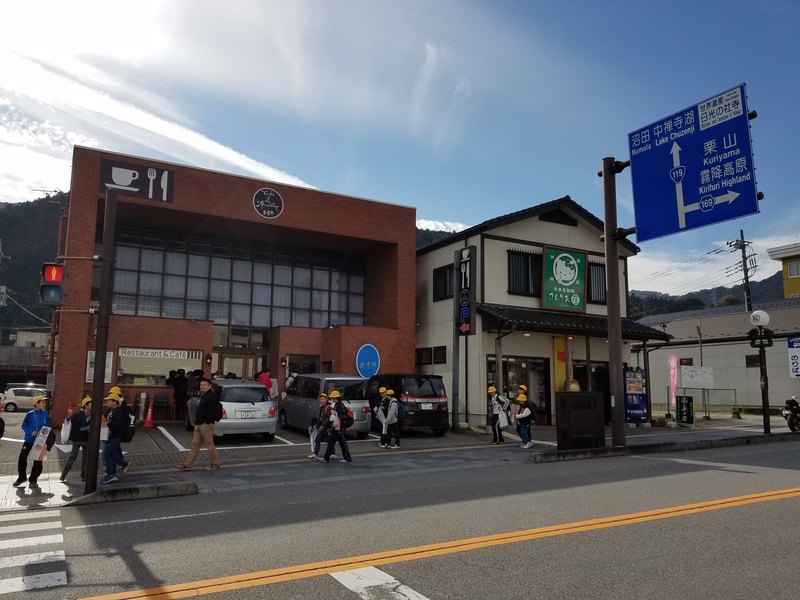 As we walk up the hill through town towards the sights we pass by a bunch of kids with yellow hats. 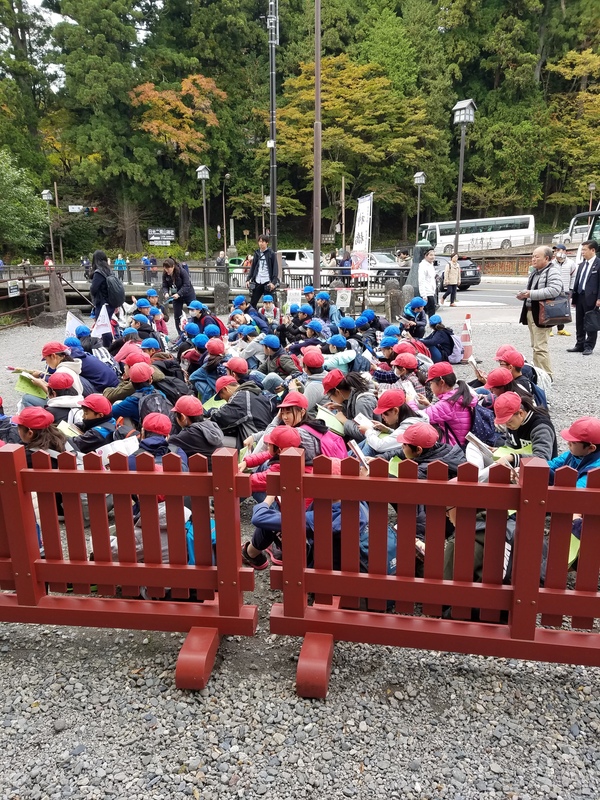 Must be a class field trip. They all say hello as they go passed, giddy at the chance to be able to use the word. 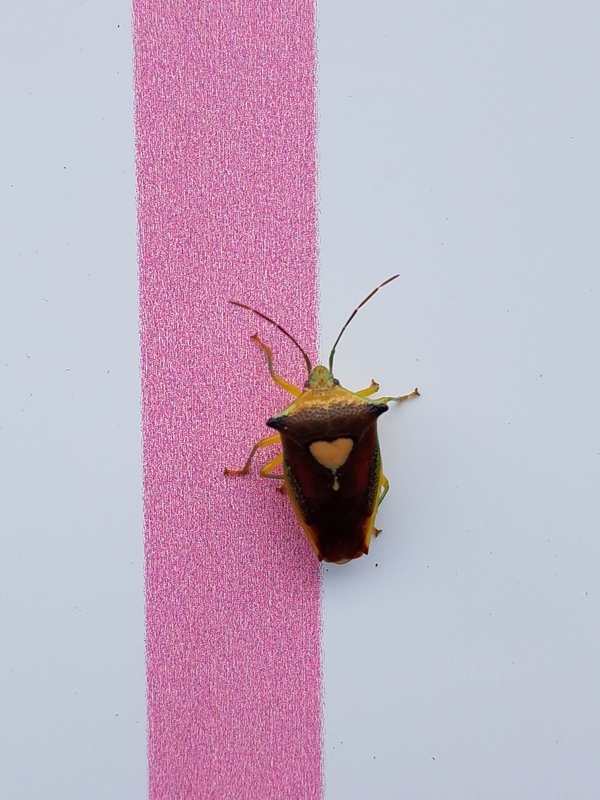 Pretty darned cute. Oh here come some more! 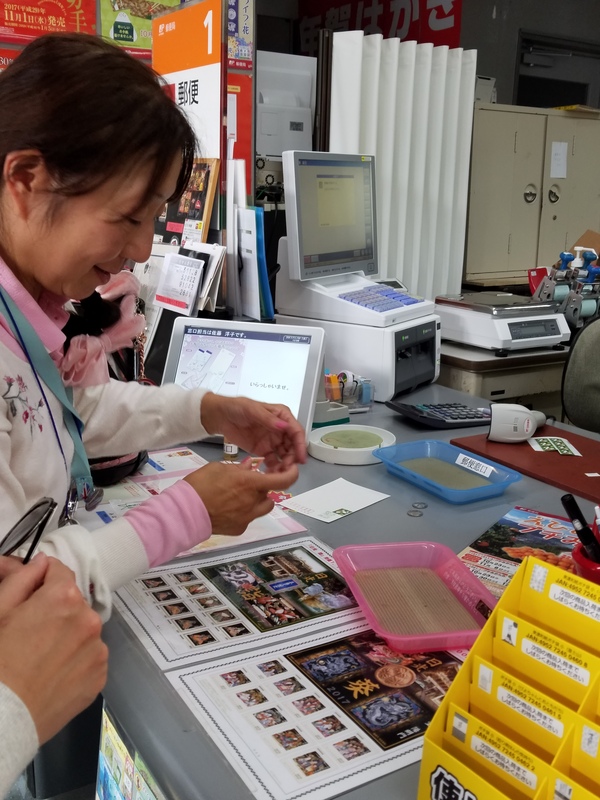 Queenie stops at the Nikkō post office to get stamps for some postcards. The girl in line in front of us gives us her queue ticket. “Oh no, it’s ok. Really.” But she’s too nice and won’t have it. She wants to know where we’re from. We tell her Canada and Taiwan. She makes a heart shape with her hands and says love. Haha yes we’re together. She apologizes for her English. She’s so polite and sweet. 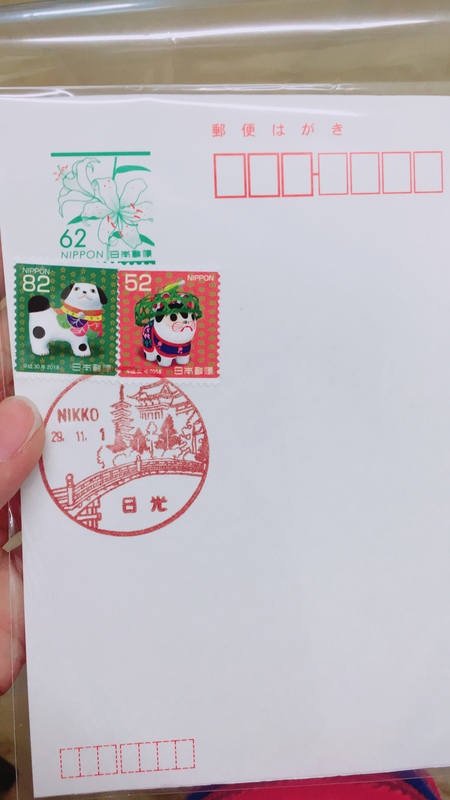 We get stamps and she insists on getting us a special stamp from this post office. 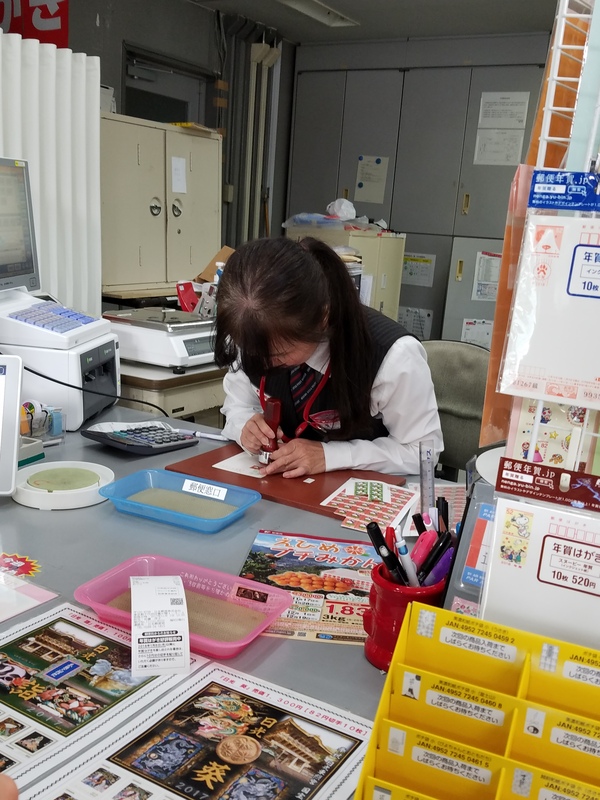 She talks to the post office girl who nods and gets out a giant rubber stamp. The stamp ends up being this great image of the iconic bridge, tower and temple here in town that we’re walking towards now. The older lady is so happy with how it turned out. She’s very pleased with herself and seems to have a fond respect for us. She gets some money out and starts to pay for the stamp. I put my hand out, “Oh no, no, no you can’t. You’re being too nice. It’s fine, it’s fine.” But again she’s not having it and so we just thank her over and over. I ask if she wants a picture or anything. No she doesn’t. 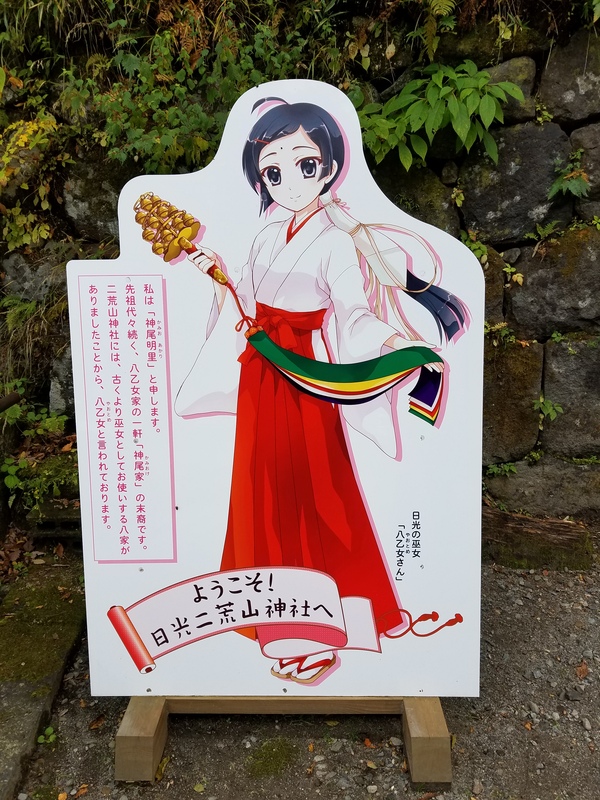 I think she just wants us to enjoy our time in the town she’s so proud of. We walk out waving and thanking her graciously. That’s just amazingly nice. 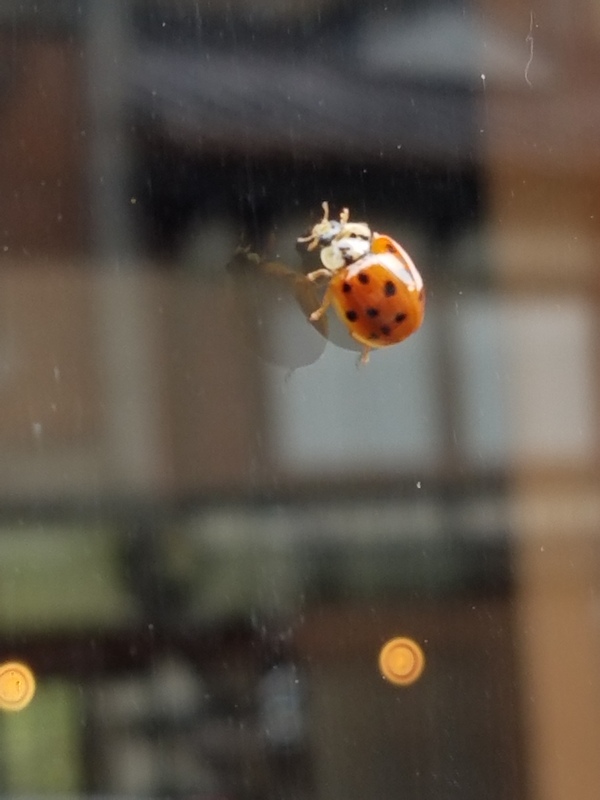 If you believe in luck and the like, there was a lady bug on the window as we walked out. 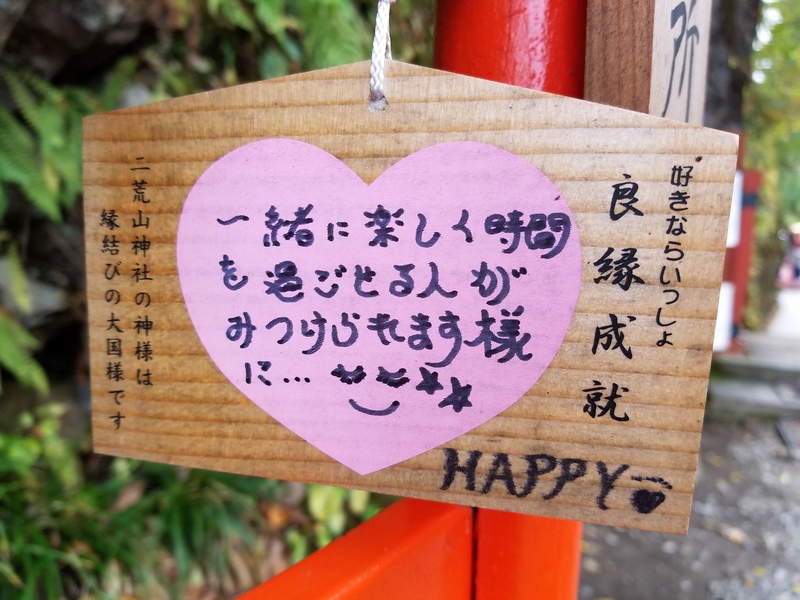 Soon we’re at the Shinkyo Bridge. There are buses rolling into town. 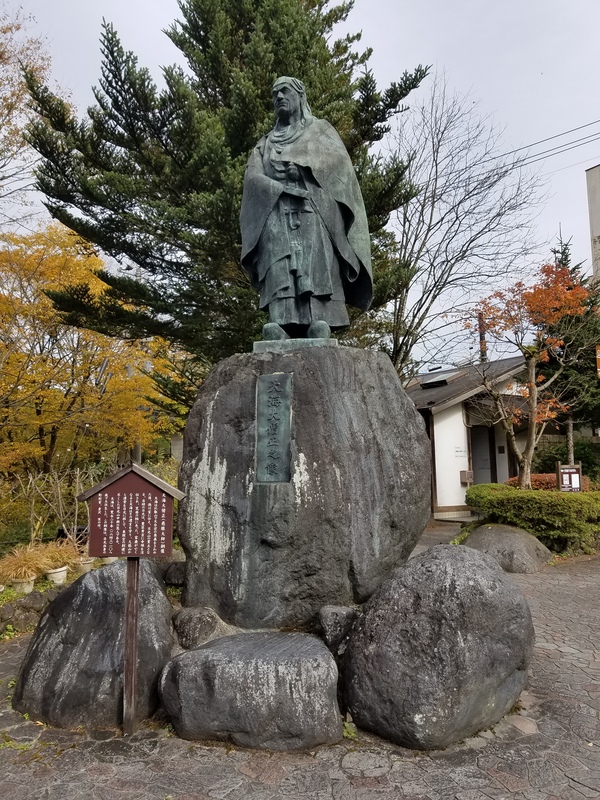 they pass by this statue in the opposite direction as we walk up to the bridge. There is no one out on the bridge which seems weird. Oh ok, you have to pay to actually get on the bridge. But it’s only 5 bucks or something. Let’s go! There is a tragic tale at the beginning of the bridge. 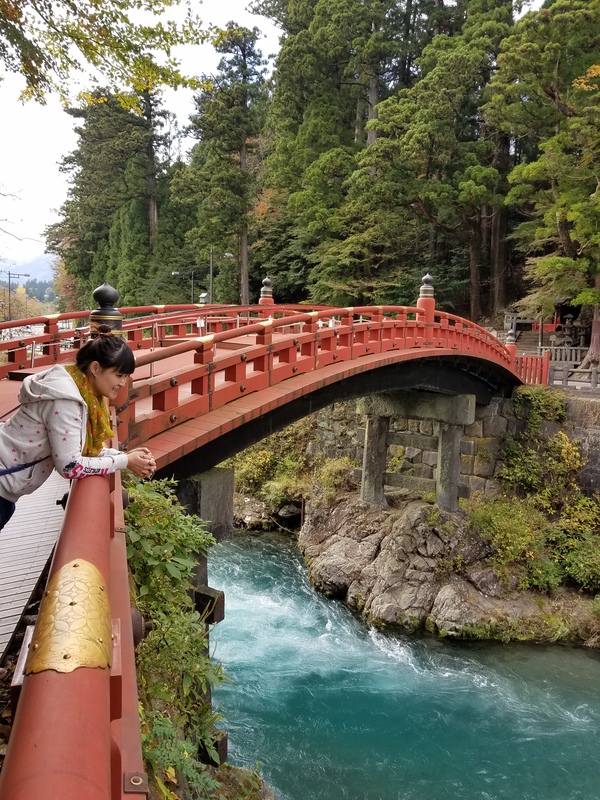 I can’t figure out the details really but what I can gather is that this pretty princess type died on the bridge while waiting for her lover to return home. Now the bridge is haunted. So it’s a love bridge, but also scary? 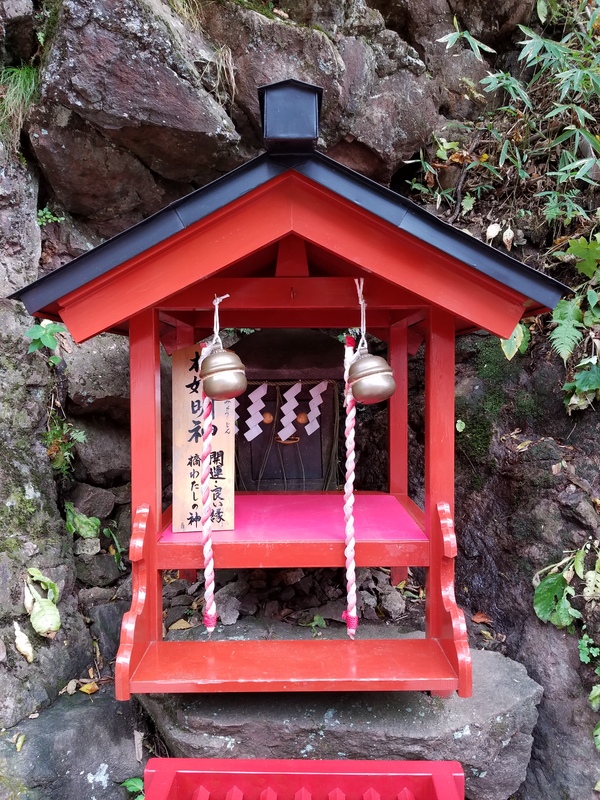 Apparently these types of goddesses that reside over bridges are called Hashihime. We take our time on the bridge. We’re the only ones out here (which means we’re the assholes in all the cheapskates pictures). 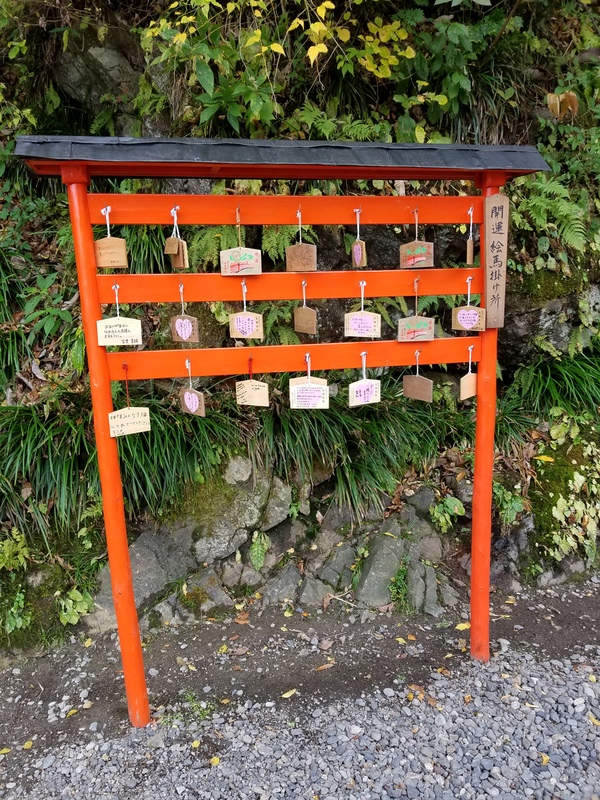 There is a message board to post love notes on, a little shrine and then a donation box if you want to brave the wrath of the Hashihime and cross the bridge. We pony up, meander around, and get some pics. It’s a nice spot with the sound of the water rushing underneath it. Looks like we get done just in time as there is now a group of 75 or so school kids waiting to get on the bridge. Maybe the yellow hats are done and now it’s the reds and blues turn. 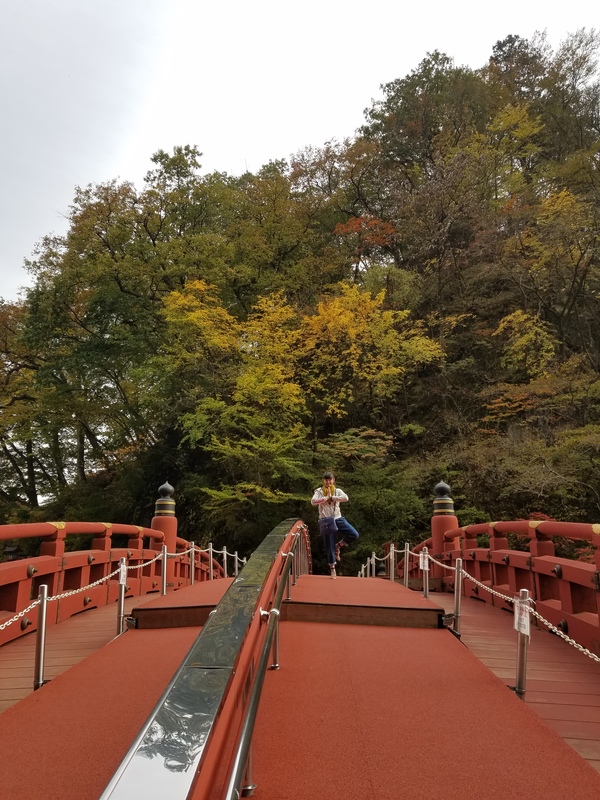 The Shinkyo Bridge is also at the base of the temples and mausoleum area that basically starts across the street. We decide to go back down the hill for a sec though, just to grab some lunch. We find a place called Hippari Dako that looks like a good little joint. 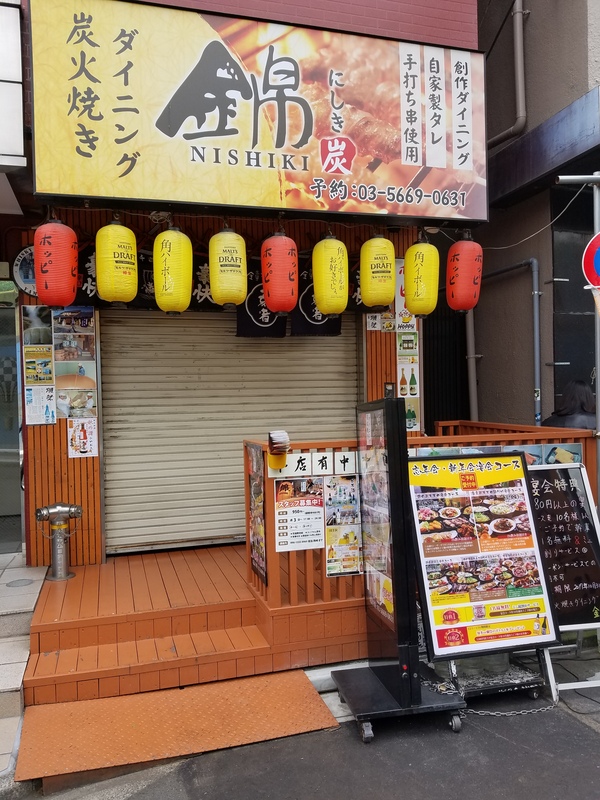 Turns out it’s the go to spot for grub in Nikkō .